The value of planning ahead for the growing season should never be underestimated and our GrowGuides and Garden Planner can be a great help here. Consider what went well in the garden last year and what didn’t – which vegetables were so popular you never had enough, and which did you have a glut of and couldn’t even give away? Deciding what not to grow is every bit as important as what should be grown. For instance, last year I ended up digging up my enormously successful rhubarb plant and donating it to the local college’s horticulture department after I discovered that all of my friends and family either already had their own rhubarb, or hated the taste! Check through old seed packets to see if there are any left over to sow this year, but bear in mind that over time the germination rate is likely to decrease – see our article on seed storage for details. Then, when you have assessed the seed you already have, browse through some seed companies’ catalogues for fresh seed. It’s always good fun to try out new varieties to grow alongside old favourites that you know perform well. Why not experiment with purple carrots, lemon coriander, or spiky-headed Romanesco cauliflower? Who knows, you might even discover your new favourite vegetable! Most sheds and outbuildings will benefit from some maintenance and repair over the winter. It might be too cold to paint but it is still worth checking for and fixing any loose or rotten boards, and making sure that door hinges are in good order to help eliminate draughts. Sharpen and oil the blades of gardening tools – I’ve found that vegetable oil works just as well as more expensive (and less environmentally-friendly) oils, and it also can be used on the wooden handles of tools. 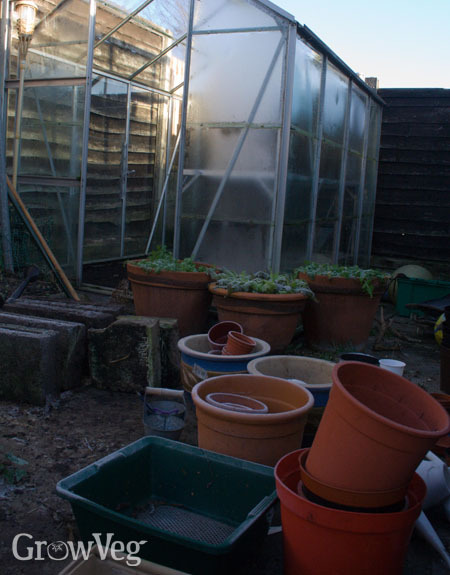 If you have a greenhouse or cold frame then the glazing and surfaces will need a good clean and scrub out pots and seed trays too. Our article on Spring Cleaning a Greenhouse has all the essential details. You could also create a ‘hot bed’ system – these have been used since Victorian times to provide bottom heat for winter salad crops and early-sown seedlings. A hot bed consists of a deep layer of fresh, strawy manure covered with a mixture of equal parts topsoil and garden compost. As the manure rots it will generate heat, which will warm the soil above it – leave it for a week or so to heat up before planting to ensure it is ready for seedlings. Winter digging can be done now if the ground is workable and not frozen but first consider whether you need to. Digging disturbs soil structure and beneficial soil-dwelling organisms, so only do it if your soil really requires it – for instance when starting a new plot, or if you have had serious problems with insects in the last season and you want to expose any grubs or overwintering pests for birds to eat. However, if your soil is very heavy clay you may find you need to dig it annually to improve its structure and drainage, adding plenty of well-rotted compost. While you are doing this you can also check for ‘volunteer’ potatoes – the ones which are inevitably missed when digging up the previous crop – and remove them to avoid passing on diseases such as blight. Lighter soils can be improved with a mulch of last year’s leafmould, which the worms will work in for you. Many fruit trees and bushes can be pruned now – see our article Winter Pruning of Gooseberries and Currant Bushes for tips - and make sure that stakes and ties on existing fruit trees are in good condition. Depending on the weather you may be able to continue to harvest some vegetables such as swedes, cabbages, chicory and kale. After harvesting brassicas with tough stems, dig a trench about as deep as a spade’s blade where you’re going to plant peas or beans this year, then lay the brassica stems in the bottom of the trench and chop them up with a sharp spade. You can add other veg scraps, too – this compost trench will provide wonderful, organic (and free!) slow-release fertiliser for your legumes. What else can you do? Well, it depends on your climate and how mild or severe your winter is this year, but there might be weeds to deal with, straw or fleece mulches to be applied to overwintering crops, or accumulations of snow to be knocked off plants, and you will need to check on any stored fruit and vegetables regularly, and remove any which have gone bad. One of my essential items for the garden is the humble plastic bottle, so I usually start collecting them now to use as cheap and cheerful cloches for seedlings. Filled with water, they’re also useful for placing inside cold frames where they will absorb heat from the sun during the day and then release it at night, helping to keep the frost at bay to protect early seedlings at the start of the growing season. "You mention fleeces as a mulch. I have sheep and LOTS of wool. How do you suggest I use it? This year I wrapped some gardenias in wool then enclosed with a row cover cloth. I'm waiting to see if they survive. " "Using plastic bottles sounds like a good idea. Can you explain how you use them to protect the seedlings? Can you use milk jugs or only clear plastic bottles?" "Great ideas and reminders. 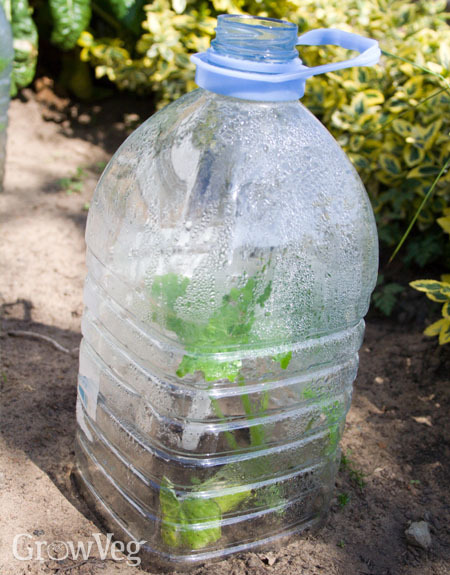 I use 2 liter soda bottles or gallon milk jugs as mini greenhouses. I like your idea with the clear plastic jug! I punch a hole in the lid and another hole in the top of the bottle. I use twist ties to keep them together. That way, you can remove the lid to vent your plant and not lose the lid. I take them off in the early morning and put them back in the evening. I normally use these for things like tomato or squash/melon seedlings for an earlier harvest. I live in Virginia, Zone 7b, but I can get ripe tomatoes in June using this little trick. " "Later, in the early spring, when it still freezes overnight, but does not usually snow, I have had great luck placing large coffee cans (both ends open) over seedlings. It protects them from the wind. Overnight, I pop the plastic lids on (after I cut some air holes)to keep the young plants from freezing. By the time they are stretching out the top of the can, they only need the wind protection. Otherwise, it is easy each to lay plastic over them at night! I've not had trouble gently lifting the cans up. And more than once, I've heard people complaining that their tomatoes froze during an extra cold evening, while mine have been comfy and waiting for the lid to be removed! Just a little idea." "That's a great idea, Laura! Thanks for sharing that tip"
"Frances, I was referring to horticultural fleece, a thin, gauzy material which can be pegged to the ground or wrapped around plants to protect them - it lets in light, air and moisture, but protects the plants from frost. I have heard of people using sheep's wool to suppress weeds however, and I know there is an organic compost on the market made with sheep's wool and bracken, but I don't have first-hand experience of using either of those things I'm afraid. If anyone does, perhaps you could let us know what you thought by adding a comment? Stacie, I cut the bottoms out of plastic bottles and place them over seedlings to make mini cloches - they help to keep the early-sown seedlings frost-free and are much cheaper than shop-bought plastic cloches!" "Hi Ann Marie I keep a little pile of used coke/lemonade plastic bottles for the same use as you do but I put in a 2ft cane through the top so the wind does not blow over the light plastic/bottle. Then I put a small Actimel(milk health drink)bottle on the top.This is healthy to, when you bend over to check how your young plant is doing you don't poke your eye out with the end of the cane." "Great tips Tony. My garden is on a windy site and I usually just sink the bottles into the soil a little to stop them blowing away, but I have to admit that's not always successful! " "Tony, I also like your "cane" idea. I have used canes in the garden and poked myself often, so a twist tie or something is a good idea. Like Anne Marie, I set my protection into the ground, but the cane would certainly help at the end of a row or perhaps near the edges of a small planted area. " "Hi Laura , we have a few fox's on our allotment and they get very playful so I use as many bottles as I can .I'm glad that I didn't put nets over my broad beans this year with the snow that we have just had they would all be pined down.I know this as the net over the fish pond has captured all the snow and is sitting on the water.But the iceicles coming down where the waterfall is are a picture. " "We seem to be having "spring" in my area so far. Had to go out and heavily mulch my bulb plants who are thinking the same thing. When the other shoe drops here, and I'm sure it will, I hope I can save them so I have bloom when the real spring gets here. Frankly the weather is so mild for Feb, it's kinda creepy. We've gotten mainly rain, but I keep thinking we are going to get a huge snow storm one day soon. The midwest just got hit with a massive storm last week, but most of it has gone north. One of these days our luck is going to run out. LOL Just not in March, please, Lord! " "This information is really informational as I am having the problem in maintaining my kitchen garden during winters.Looking for some more advice." "The idea of using plastic bottles is really good and Eco friendly.Looking for some more advice." "To TheExpertVGL when finished with the little Actimel bottles put them on the end of your bamboo canes so when you bend down to look at your plants or weeding YOU DON'T POKE YOURSELF IN THE EYE."